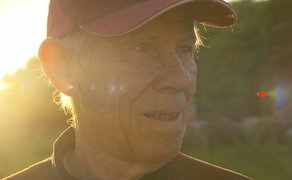 IFTN caught up with director Frank Shouldice to find out more about his debut feature documentary ‘The Man Who Wanted to Fly’, which releases in Irish cinemas this Friday, March 29th. ‘The Man Who Wanted To Fly’ tells the irresistible story of 80-something bachelor farmer Bobby Coote from Cavan who has had a lifelong dream to fly a plane. Enlisting the help of his neighbour Sean, the two set out to build their own field of dreams, cutting out a runway in Sean’s farm and even build a hangar in this small rural community. Bobby will get no encouragement from his brother Ernie, another octogenarian in the Coote family home. Ernie thinks the whole thing is daft but Bobby is determined to take to the skies if it’s the last thing he does. Capturing the wonder of one man’s dreams ‘The Man Who Wanted To Fly’ is a unique journey into a disappearing border hinterland and is sure to delight audiences across Ireland. IFTN journalist Nathan Griffin caught up with Frank to find out more about the feature documentary. IFTN: How did you first cross paths with Bobby? IFTN: What captured your attention about that encounter and how did you land on the narrative you chose? IFTN: And what was it about Bobby that made you believe that his dream could come to fruition? IFTN: On the funding front, I suppose that worked in your favour due to the fact that it was a much longer process than originally envisaged. You probably avoided the pressures of meeting deadlines that typically come with development funding? IFTN: In relation to the editing process, a large amount of footage must have been collected during those five and half years of filming. Can you tell me a little bit about the editorial approach that you took to such a vast quantity of footage? “I found that hard but it was essential and I worked with Emer O'Clery who edited the film and did a fantastic job. For what we had that we didn't use, there were a lot of other issues that we would have liked to get to but within it we covered a lot of ground. We could have gone further but for every filmmaker making documentaries, it is inevitable that you will have to lose certain scenes. Maybe if we ever get a DVD together we can put in the missing scenes because there are a couple that still stand out in my mind!"